One of the unfortunate stories we’ve documented over the last several years has been the alarming number of New York City taxi cab driver suicides. The most recent of these tragic events occurred just last month when a cab driver in Queens became the eighth person over the past year to take his own life as the pressure of Uber and Lyft continues to make fares difficult to find while driving NYC taxi medallions lower in value. Of course, taxi medallions used to be a retirement plan in and of themselves. Many cab drivers have borne significant financial burdens that they committed to, years ago, in hopes that their medallion would be of substantial value that they could retire on. 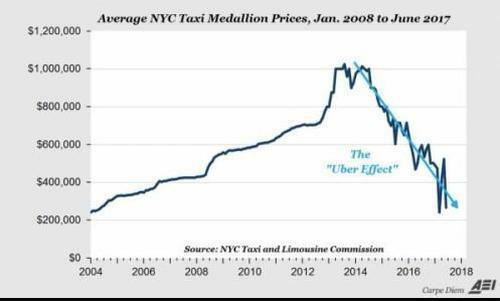 But the influx of ride-sharing apps over the last five or six years has driven the price (and value) of medallions lower on a steady basis. As shown in the chart above, the price of a medallion has tumbled from over $1 million around 2013 to just over $200,000 currently, the lowest in over a decade. As a result, many cab drivers who have invested their life savings in owning a medallion have seen themselves fall into financial ruin. To get closer to the issue, Vice News recently sent out lifelong New York resident and comedian Colin Quinn to speak with a couple of cab drivers about not only the problems that they face, but the rash of suicides that have hit the industry. The first driver he spoke to, told him off the bat that he had taken out a second mortgage in order to help pay off his medallion some years back. He shares with Colin his story and concludes that he must continue to pay off the medallion regardless of the fact that it has dropped near 80% in price. Another driver was even more candid, telling Quinn that having Uber and Lyft in the city weren’t even too big of a deal – namely because he, a black man, had a very difficult time getting a cab when he wasn’t working and needed to move around the city. But he told Quinn that when Uber and Lyft began to lower prices – something they could do as a result of not paying a cut to the city like cab drivers have to – then it became unfair, and that’s when taxi drivers “lost”. A third cabdriver told Quinn that he had averaged about 3.6 passengers per hour before Uber and Lyft came into the city – a rate that generally allowed him to meet the budget he had set for himself. Now, he says he sometimes picks up just two passengers or less per hour. He also told Quinn he estimates about 35% less passengers overall for cabdrivers as a result of the now 80,000 Uber and Lyft drivers in the city. One cab driver – a friend of a driver who recently killed himself – told Quinn that the man who killed himself was depressed and mortified as a result of his approaching retirement while feeling he wouldn’t be able to make his basic utility bills and living expenses after working for decades. 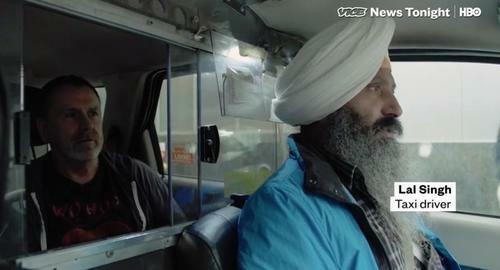 Singh owes about $6200 per month on the medallion he bought in 2000 and spends his day driving the length of Manhattan, top to bottom, looking for passengers. “When you have nothing to do, we are suffering. What are you living for?” he continued. As we discussed previously here, New York City appears set to finally implement some changes to attempt to protect its cabdrivers – the only question is whether it’s too little too late at this point. 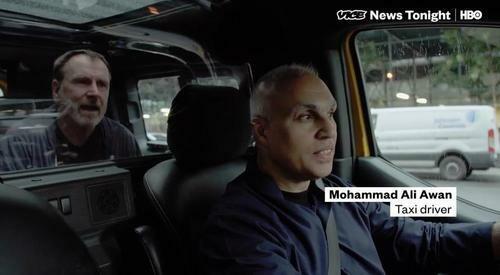 You can watch the full Vice Media video here.